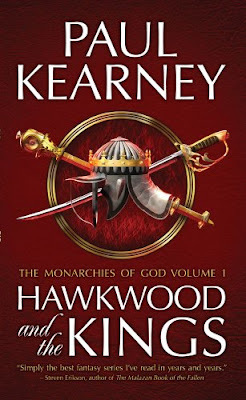 Pat's Fantasy Hotlist: More inexpensive book goodies! You can now download the first omnibus edition of Paul Kearney's The Monarchies of God, Hawkwood and the Kings, for only 1.92$ here. The world is in turmoil. In the east the savage Merduks, followers of the Prophet Ahrimuz, have captured the holy city of Aekir. The western kingdoms are too distracted by internecine bickering to intervene and the Church seems more obsessed with rooting out heresy. It is an age where men go to the stake for the taint of magic in their blood, where gunpowder and cannon co-exit with werewolves and sorcerers. It is the turning point when two get reilgions will fight to the death and the common folk will struggle to merely survive. 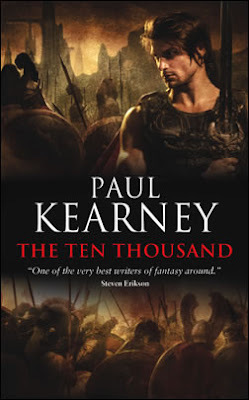 Even better, you can also get your hands on Kearney's The Ten Thousand, first volume in the terrific The Macht trilogy, for only 1.92$ here! Which country are these kindle prices meant to apply to, since I rarely find them available at that price.